It’s the last week of the year for several of us and preparations are in full swing to celebrate the first day of the New Year. Invitations to attend community celebrations have already started making the rounds and the “I’ll-go-if-you-go” discussions have begun. Poila Boishakh celebrations have undergone a massive change over the years on the personal and social front. With the celebrations being on Monday, most of my friends are in two minds about whether they want to join because “office tomorrow!” And then, of course, there is the already oppressive heat – barely into mid-April and we’ve been scorched as temperatures hover between 40℃ and 45℃. My idea of a perfect Poila Boishakh celebration would be to plan a simple home-cooked meal and tuck into it surrounded by family & friends whilst enjoying the cool of an air-conditioned room. I’ll probably take the decision on that by the weekend. But the idea has prompted me to plan a simple 4-course Poila Boishakh meal for the readers of From The Corner Table. Over the course of this week, I’ll be sharing four recipes that will help you plan a cosy party, should you intend to. The first course of this meal is the Mishti Ghee Bhaat – a delicate rice preparation with sweet undertones that make it a perfect accompaniment for any main – is a certified crowd pleaser. A must on the menu during celebrations, the mishti ghee bhaat speaks of an effort to enhance the menu, even if all you are serving with the rice is a dal and some papad. This rice preparation that can be loaded with dried fruits and nuts speaks of the home cook’s effort to make the diners feel special. Recipes for the sweet rice differ in households – some prefer to cook the way I’ve learned and shared with you. And there are others who throw everything together into a pot and let the rice cook on its own. There are also versions where this rice dish is flavoured and coloured with turmeric and/or saffron to give it an attractive tint of yellow. My mother, who taught me this recipe, prefers to work on a time-saving mode and has found this recipe working to her benefit. “I get the onions frying on one side and the rice cooking on the other burner. Both get done around the same time so then all you need to do is throw everything into the pan and you are done!” she explains. And yes, when she says “throw everything into the pan” she literally means that! I’ve never ever seen her measure out anything in cups or spoons. “I’ve been cooking for so many years. I just know,” she says when I ask her “how!” Going back to the sweet rice, there are few dos and don’ts that you need to keep in mind. Oil is an absolute NO for this dish. Use unsalted butter if you have no ghee. Sweet is a matter of choice; adjust the sweetness depending on what you are serving the rice dish with. The sweetness level can be a little low if serving with a mildly-spiced dish. Notch up the sweet if the accompaniment is spicy. Watch out for the 2nd course of the Poila Boishakh meal on Thursday. To make sure you don’t miss the recipe, subscribe to the newsletter to receive the latest post From The Corner Table in your inbox. Until next time, happy cooking and eating! 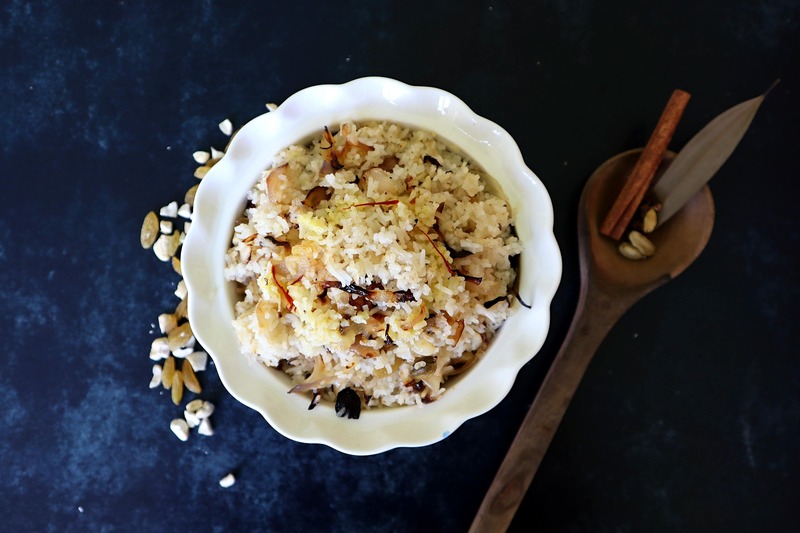 Fragrant long-grained rice cooked in ghee and garnished with raisins. Wash rice thoroughly and soak for 30 minutes. Cook the rice till it is firm to the bite. Strain and set aside. Soak the saffron strands in warm milk, set aside. As the rice cooks, heat the ghee in a kadhai or wok on medium flame. Once the ghee is hot enough, add the sliced onions and fry till golden brown and slightly crisp. Strain from the ghee and set aside. To the hot ghee, add cinnamon, cardamom, cloves and bay leaves. Cook till the spices start to splutter. Add the cooked rice and mix well to ensure the rice is coated in ghee. Adding the sugar and salt, mix well and cook till the rice is caramelized brown. Mix in the fried onion and adjust the seasonings. Garnish with saffron milk and serve hot with curry of choice. You can substitute the ghee with unsalted butter. You can make similar rice without onions; add almonds to make the rice tastier. I love using ghee when I cook. I’d be honored if you shared this recipe (and any others) at our What’s for Dinner link party! Delighted to have someone else who loves ghee! I’ll definitely take a look at sharing the recipe on What’s for Dinner. Thank you for the info.